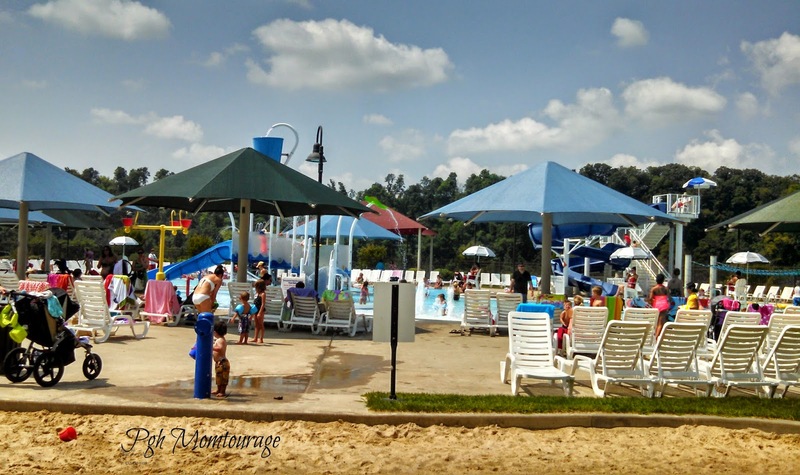 Pgh Momtourage: Pittsburgh's Hidden Water Park! I was able to track down their marketing supervisor who was more than kind in showing me around the facility, telling me about the waterpark, and sharing passes for my family to check it out. My family loved spending the day here, my kids had a wonderful time! The Outdoor Aquatics Area hosts 6,000 sq. 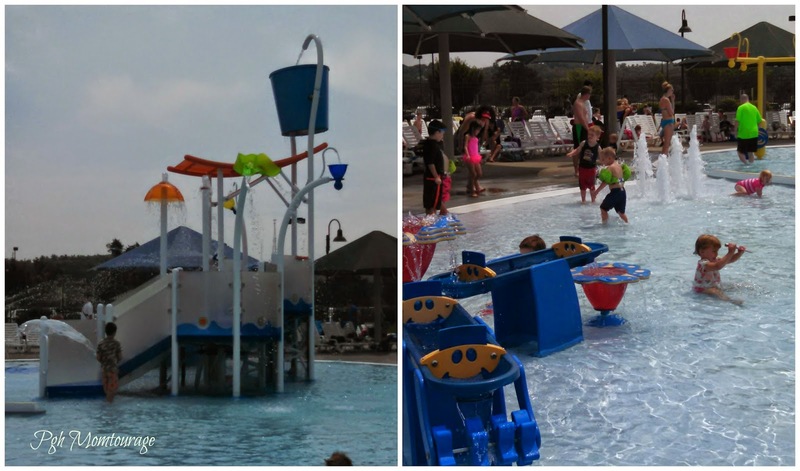 ft. of water with zero depth entry, interactive water structure and gadgets including a 60,000 gallon bucket which teeters over and splashes over the crowd, tot and teen slides, lily pads, handicap lift and three lane leisure pool with underwater benches. Surrounding the aquatics area are lounge chairs, a grassy lawn, covered pavilions where members and guests picnic, vending machines and separate outdoor men's/women's locker rooms and family changing rooms. 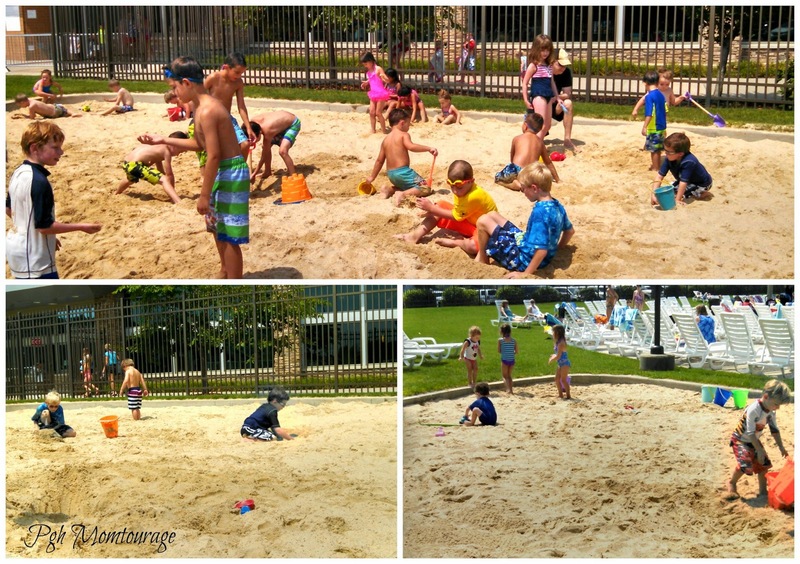 And when kids are looking for a change of scenery or waiting out the hourly 10 minute water break, having this sandy beach area is ideal! Although the outdoor water area is only open through Labor Day, the great news is the indoor waterpark is open year round! 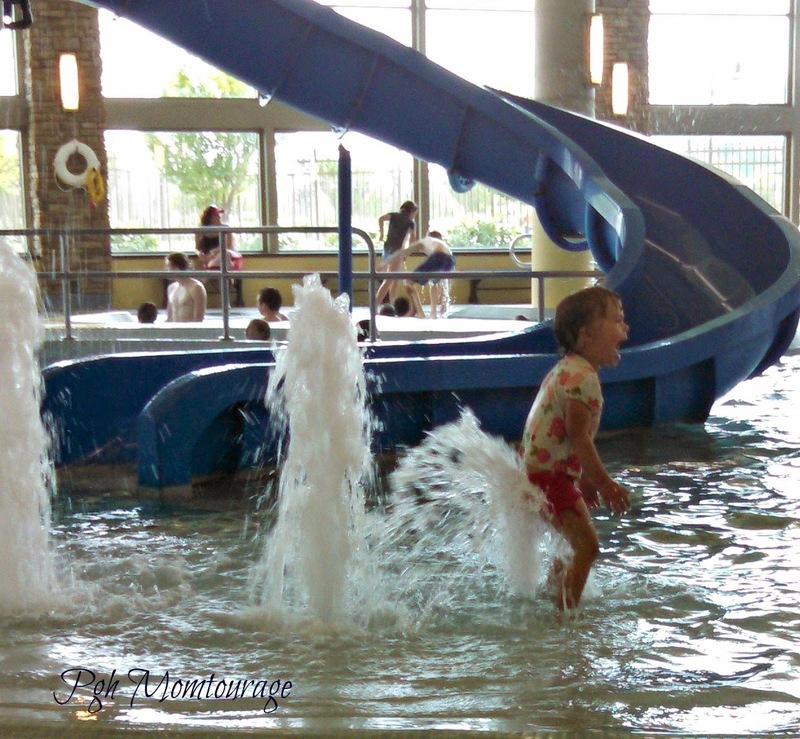 The Indoor Aquatics Center hosts an interactive water structure and gadgets, slides, tots area, handicap lift, four lane lap pool and large whirlpool. Zero depth entry makes it ideal for little ones! 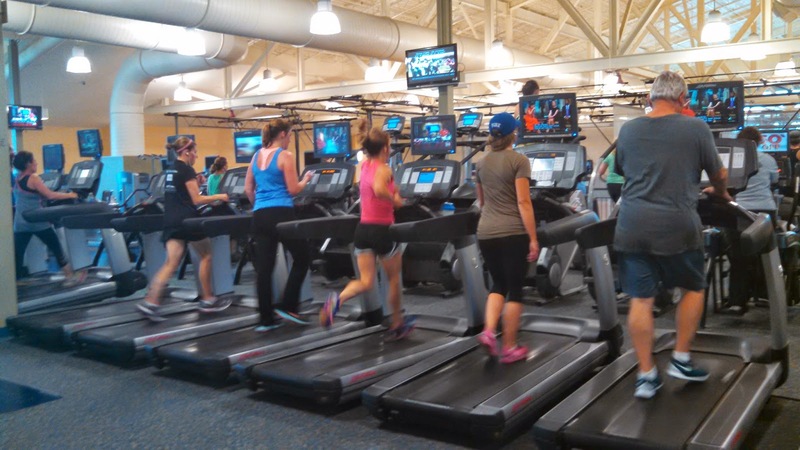 If you are also looking for a fitness center, the Community & Recreation Center at Boyce Mayview Park has it all! The center's first floor offers a large community gathering area, two group exercise studios, children's playroom (babysitting), two poolside party rooms in addition to a 3,600 sq. ft. community room, men's/women's locker rooms, family changing rooms and two full size gymnasiums. The large gymnasium can be subdivided and used for numerous recreation programs for all ages such as volleyball, basketball, pickleball, after school programs, boot camp, summer camps, teen events, and many others. The second floor contains a state of the art fitness area with Hammer Strength, Life Fitness and Expresso exercise equipment. The cardio equipment as well as the Expresso Bikes offer individual television/ multi-media screens and virtual trainers with an abundance of course and work out options. The low impact floor 1/8 mile walking/jogging track overlooks the first floor amenities as well as many outdoor view corridors. Aquatic and Fitness areas will close 15 minutes prior to building closing. Memberships are available for use of this facility year-round, but you can also purchase a daily pass which includes all of their facilities, as well as the water venues, for only $12 a day. You do not have to be a member to purchase the $12 venue ticket! If you have questions, contact their Admin Offices. Good info... did I miss where it's located? Of all the year we lived in Pittsburgh, this is the first time hearing, seeing about it! Wow, what an awesome place it looks! Would love to visit! although it's a great park/pool...i feel like $12 is too high! i live within walking distance, but for a family of 4 to go for a few hours on a weekend day, it's a little pricey. We opt for Mt Lebo's pool which is $7 per person...saves us a bit! It just got built about 5 or so years ago. So it's a pretty new place that only USC people know about. Is your waterpark open to the public, or is for USC residents only. It's a really nice park by the way! My daughter birthday was on last week. I had an exclusive plan about her birthday. One of my friend helped me a lot to arrange a party. I just rent an Bouncy castle from a bouncy castle rentals company and it's made my kid birthday more enjoyable. This is awesome!!! Thank you so very very much for sharing this hidden gem!! From one mom to another ~ thank you!!! Im excited to go taking my babies! Its fantastic!! Thanks for sharing. Currently I am enjoying my vacations in Waterpark in Montana. 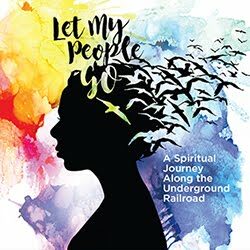 I have interests in different adventures, amusement parks and exploring cities.I will make time to visit this hidden gem. Good short and this ray ban aviator treat impotence baratas post helped me a great deal. THIS IS NOT A WATERPARK! Great family/local pool but not a waterpark! These mspy reviews would show you all the potential of using such software.